Top Dodger prospects Cody Bellinger and Willie Calhoun are selections for tonight’s Arizona Fall League Fall Stars Game, which will be played at 5 p.m. PDT and broadcast live on MLB Network. Fifteen of baseball’s top 100 prospects were selected for the game — including Bellinger (31) and Calhoun (87). Joc Pederson (2012) and Corey Seager (2013 and 2014) are Dodgers who have played in recent Fall Stars games. Some of the biggest stars in baseball — Mike Trout, Bryce Harper, Kris Bryant and Nolan Arenado — have also played in it, as well. You could have made the argument at many points during the 2015 season that the Triple-A Oklahoma City Dodgers were the 31st Major league team. And you can start the 2016 season saying the same thing. The Dodgers’ Triple-A affiliate begins the season with 17 players with Major League experience on its roster, including six relief pitchers. That’s just one interesting storyline with rosters set the day before Thursday’s Minor League Opening Day. So let’s go team by team. 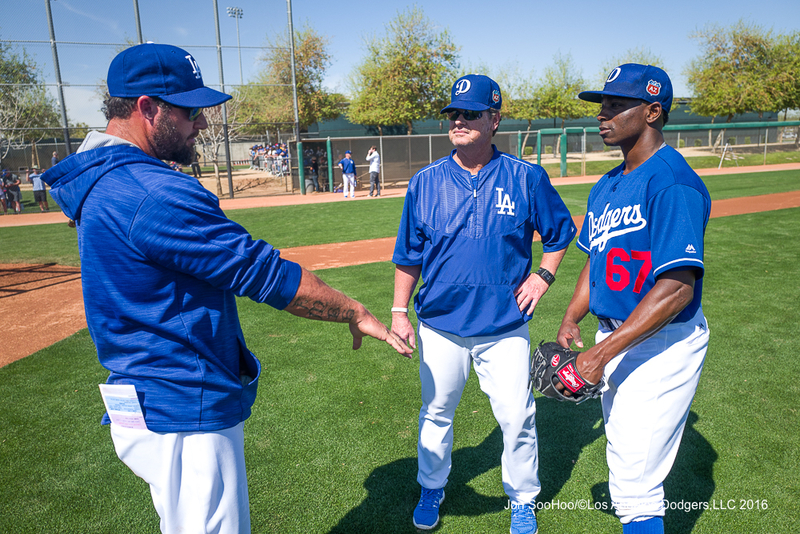 Eric Gagne and Rick Honeycutt talk with Jharel Cotton on February 28. This afternoon, the Dodgers made their first bulk cuts of Spring Training, optioning right-handed pitcher Jharel Cotton to minor league camp and reassigning non-roster pitchers Lisalverto Bonilla, Chase De Jong, Caleb Dirks, Jacob Rhame, Chris Anderson, outfielder Alex Hassan and catcher Kyle Farmer. Cotton, Rhame, Anderson and Farmer are homegrown prospects, while De Jong, Dirks and Hassan were acquired within the past year. At 27, Hassan is the oldest, followed by the 25-year-old Bonilla (who has been recovering from Tommy John surgery) and Farmer. 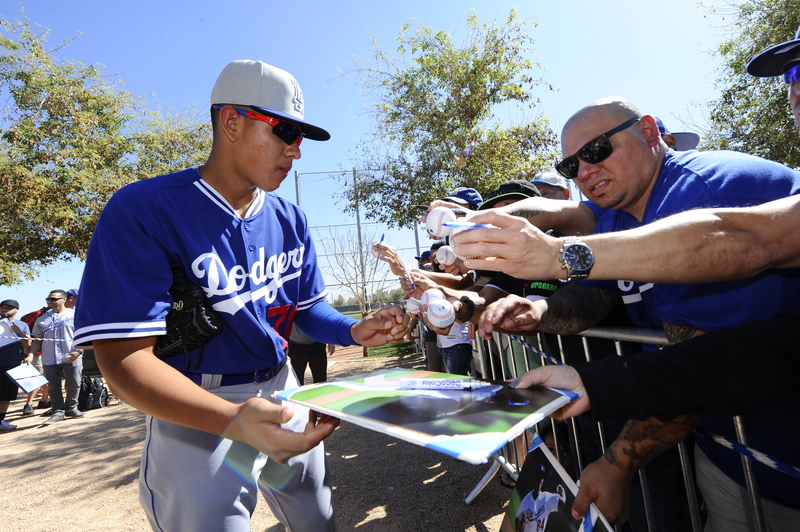 The former first-round pick in Dodger camp that people are talking about is Corey Seager, and the prospects in Arizona being mentioned first are Julio Urias and Jose De Leon. 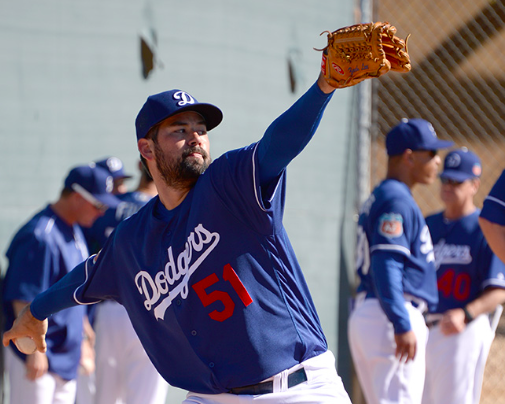 Things are quiet around former first-rounders Zach Lee and Chris Anderson, who are also at Camelback Ranch — Lee as a 40-man roster player and Anderson as a non-roster invite. Anderson was an across-the board (MLB.com, Baseball Prospectus and Baseball America) Dodgers top-10 prospect a year ago, and Lee rated as the organization’s No. 1 prospect by Baseball America in 2011 and was top five in the publication’s organizational list every year from 2010 to 2013. Maybe some of the people who make these lists have less faith in these two pitchers, but at least one coach in the Dodger organization is still strongly in both pitchers’ corners — that being Triple-A Oklahoma City Dodgers bullpen coach Matt Herges. 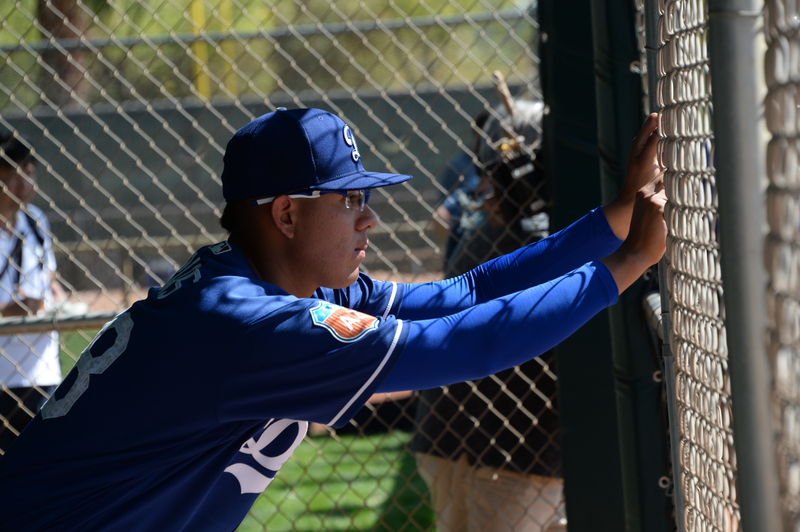 Minor-league pitching prospects Julio Urias, Jose DeLeon and Chris Anderson are among the 16 players not currently on the 40-man roster who have been invited to Major League camp for Spring Training. The 19-year-old Urias is the No. 1 left-handed pitching prospect in baseball, according to MLB.com, while DeLeon, 23, is the No. 5 righty. The 23-year-old Anderson, the Dodgers’ first-round draft choice in the 2013 draft, had a 4.05 ERA and 7.0 strikeouts per nine innings for Double-A Tulsa in 2015. The hottest non-roster invite on the hitting side is Cody Bellinger, who is ranked sixth among first-base prospects in the minors. With the minor league regular season wrapped up, we’re going to split the Minor League Report in two parts this week — one for teams that are alive in the postseason and one for teams whose seasons have concluded. We begin today with the latter. We’ll catch up with the playoff-engrossed Triple-A Oklahoma City Dodgers (who caught a rough break in a 2-1, five-inning loss Wednesday), High-A Rancho Cucamonga Quakes and Low-A Great Lakes Loons (who also lost by one run in their playoff opener) on Friday. You think the trade deadline makes Los Angeles spin? Consider Tulsa. The Dodgers’ Double-A partner, the Tulsa Drillers, has a treasure chest of pitching. Three of the Dodgers top seven prospects — Julio Urias (No. 2), Jose De Leon (No. 3) and Chris Anderson (No. 7) — are in the Drillers starting rotation. So is No. 16 prospect Jharel Cotton and No. 23 Ross Stripling. Any of those pitchers could be a trade chip, and because of that, the Tulsa clubhouse has been understandably uneasy lately. Herges said the scouts and the radar guns have been constants in the stands at Drillers games. The former Dodger and 11-season big league pitcher said he’s done his best to keep his guys in the right frame of mind, but said the talk has the potential to affect them. Herges’ best advice for the guys: Ignore it. Corey Seager. There. Now that we have your attention, let’s get into what he did — again. Seager went 2 for 4 with two home runs for Triple-A Oklahoma City on Wednesday — his third multi-home run game of the season. We mentioned last week about him moving to the top of SI.com’s top prospects list. The more thorough and regarded MLB.com list will have its midyear Top 100 Prospects list out in July — likely before the Trade Deadline, according to MLB.com senior writer and prospect and draft expert Jim Callis. But it does update periodically when prospects graduate to the big leagues. With the top three guys on the list currently in the big leagues, it could move Seager up to No. 1 sooner than the midseason list. He is currently No. 5 behind Washington Single-A pitcher Lucas Giolito at No. 4. The most recent updates have allowed Double-A Tulsa starter Jose De Leon to climb into the top 100 at No. 94. Dodger 2014 first-rounder and Single-A Great Lakes pitcher Grant Holmes is at No. 79. When that midyear report comes out, De Leon could see some movement. As far as any other prospect cracking the top 100 — which the Dodgers had four of coming into this season: Joc Pederson, Seager, Julio Urias and Grant Holmes — Callis said, off the top of his head, that Chris Anderson might be the next player in line. In Anderson’s last eight starts in Double-A Tulsa, he has a 2.39 ERA/1.39 WHIP and 39 strikeouts in 49 innings. We get started this week much in the way we did in the last two weeks with the Hector Olivera Report. Olivera now has four games under his belt in Oklahoma City, and after going 0 for 4 in his Triple-A debut on Saturday, he came right back the next day and went 4 for 5 with four singles. In four OKC games, he is 6 for 17. Olivera has now played 10 minor league games between Double-A Tulsa and OKC, starting at third base in six of those contests and second base in the other four. Hector Olivera hit his first career stateside home run on Tuesday. 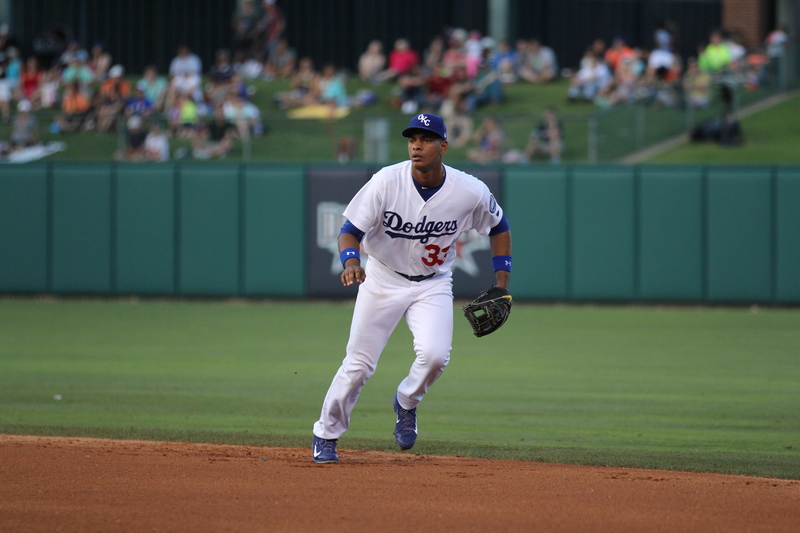 The Cuban import and Tulsa infielder took Kansas City farmhand and reliever Mark Peterson deep in the seventh inning. Olivera went 3 for 3 in the game and also walked. He is now 5 for 18 at the plate with four singles. Buzz is starting to pick up on first baseman Cody Bellinger. He’s been a regular here in the report, but there he is front and center on MiLB.com on Thursday. Bellinger is profiled here for his developing power and defensive ability. Bellinger, the son of former Yankees infielder Clay Bellinger, is batting .283/.354/.557 with 12 home runs (33 total extra-base hits) and 46 RBI in 58 games. Bellinger hit the game-winning two-run home run in the 10th inning on Wednesday against Modesto. And the reward is a selection to the California League All-Star team, which was announced Thursday. The Rancho Cucamonga Quakes are hosting the 2015 California League vs. Carolina League All-Star Game on June 23. California League batting leader Kyle Farmer, who will start for the Cal League at catcher, and second baseman Brandon Trinkwon, will join their Quake teammate Bellinger on the team. Pitcher Jose De Leon was selected, but because of his promotion to Tulsa in May, he won’t be playing.